Lee Min-ho had plastic surgery? 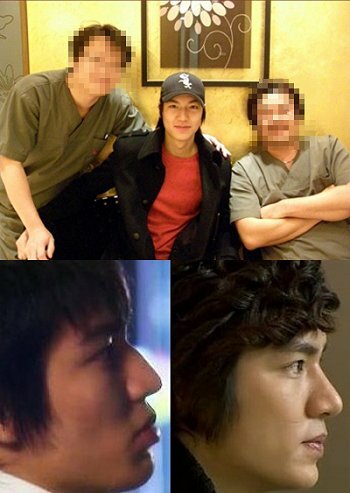 Did Boys Over Flowers (Boys Before Flowers) star Lee Min-ho (22) go for plastic surgery? But why? Isn't he perfect already? Today on Starnews Korea, a picture showing Lee with two plastic surgeons surfaced on the Internet. Why was he at the clinic? What did he get done? Speculations point to Lee Min-ho's nose. Well, if you've been one (like me) who has admired his high straight perfect nose, it might not be all genes. He might have had some help from the very skillful Korean plastic surgeons. Self appointed detectives revealed that Min-ho had his nose done on 17th December, 2007. In a recent talk show program featuring celebrities BEFORE and AFTER surgery, a surgeon remarked that it is possible Min-ho went to correct a small bump in his nose. But in a recent interview, Lee Min-ho mentioned that he has not done any plastic surgery and is in fact 100% natural. Re: Lee Min-ho had plastic surgery? Ehhhh, it's not that surprising. I'm not a supporter of plastic surgery, but it's his life-let him live it. Isn't like 90% of the Korean entertainment industry plastic, anyways? im not against plastic surgery so i dont mind ..is not like he got a new nose!!! he jus got rid of the bump .......-_- he is extremely talented and hotttttt he has a great career ahead of him and i cant wait for his next projects ...i luv BBF! @. @ wt... so what he had one? everyone goes to have one when needed and he didn't have like a huge major change in his looks. Just fixed his nose! Gosh!!! Can reporters stop making a big deal over little things?! If Lee Min-ho had done Indianapolis Plastic Surgery for himself, well its his own prerogative. Plastic surgery is not so bad as some people think. It is a help for those people that are not contented to their faces. They wanted to improve it, so they are undergoing into a plastic surgery. Anyway, he might undergone into a plastic surgery because the shape of his nose is different from the old picture. It is good to have an plastic surgery for improving the over appearance of our face and for getting nose in good shape and size. The nose job surgery is real the best for it. Visit to nosejobguide.com for collecting more infromation.